My internet went off for a little so naturally I played a bit of T-Rex Runner (Downasaur) to pass the time but got surprised with something I have never seen before when playing it, a cake. It looked like a power up or a mushroom from Super Mario, it gave me a party hat and there were gray ballons flying in the background but unfortunately no extra life. What's the reason for it to be added, I'm guessing it wasn't just a random improve of the game, is it to celebrate some birthday? Is there anything else I missed or is it just for visuals and does it matter if I jump over it and don't catch it? Notably after getting the cake the hat stood through the rounds until I refreshed the page. It marks the tenth anniversary of the release of the browser 10 years ago. See this blog post from Google Chrome’s blog on September 4, 2018. You currently have a special edition of the game out. Can you tell us more about that? Alan: Over the years, the game got a few upgrades, like pterodactyls and night mode. The latest one rolled out this week: a special “anniversary edition” for Chrome’s 10th birthday. Look out for cake, balloons, and a fancy birthday hat. Back in 2008, Google Chrome was revealed to the world via a comic book that detailed the new open source browser. 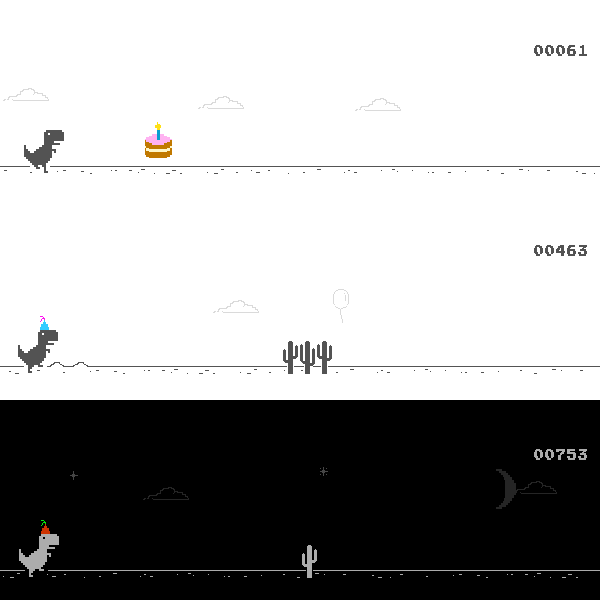 To mark its 10th anniversary this month, Google has updated and themed the whimsical Offline Dino Game. The birthday edition allows the dinosaur to collect a birthday cake and wear a party hat, while the background features balloons. This easter egg will be themed for the entire month of September. It's for the celebration of the tenth year of chrome, but a disadvantage of the cake is the party hat. It stops you from ducking under mid level birds. Not the answer you're looking for? Browse other questions tagged google-chrome downasaur or ask your own question. What does getting the Chrome icon in Angry Birds Chrome Edition do? What is the max score possible in Beat The Boot? Where is the Don't Starve save file located on Linux?